You can make DIY stamps out of everyday materials to create your own unique prints. Rubber stamps are just one way for stampers to make their mark. A wide variety of other materials can be used to make an impression on paper and these can be a great way to explore new and creative ideas. While the results are less predictable and controllable than working with rubber stamps, a rich and diverse assortment of patterns can be created using items from discarded bubble wrap to vegetables. This is a wonderful way to try new things and is a good inspiration kick-starter for times when you are short for ideas for designs. Using materials other than rubber stamps is perfect for experimental projects, and because the materials are largely low cost, there's no worry about wasting money if things go in a slightly different direction to that planned. Anything with a textured and reasonably flat surface can be used to stamp or print on paper. As well as stamping on paper and cardstock, a lot of the projects shown would be great for stamping or printing onto fabric. DIY stamps are often less intricate than shop bought stamps, and as such, they are better for big projects such as stamping on a t-shirt or pillow. You can stamp with ink or paint. On fabric, you would need fabric paint or fabric ink. This will give you a long lasting design which will be uniquely yours. To create the stamps you will need supplies such as a knife, scissors, glue, and brayer roller, depending on the project. Potato printing or stamping is probably one of the first experiences of stamping for kids. It is versatile and a great project for both youngsters and experienced stampers. Making a potato stamp in a basic shape is easy., Basic shapes are easy to cut and can look very effective. This is also an extremely low-cost way to stamp images. The main drawback of stamping with potatoes is that the potatoes will start to dry out after a while and this makes it difficult to achieve an even print. Therefore, after cutting the potato into a shape you need to use it relatively quickly. You can either cut a shape from your potato freehand or if you have a shaped cookie cutter, press it into the top of the potato and use this as the base for your heart. You simply then need to cut away the pieces of potato that you don't want to show on your stamped image. You can stamp with your potato as you would a normal stamp. Use a flat blade knife to cut the potato. If you use a knife with a serrated edge then the surface of the potato will be patterned and will give an uneven print. While this may present some interesting design opportunities, it might not give the finished effect you require. If you don't fancy cutting a heart into the potato by hand, but don't have a cookie cutter of the correct size and shape to hand, use a printed heart image and draw around this on the surface of the potato. When you stamp with the potato, remember that the potato contains water and as such it will dilute your stamping ink or paint. The potato will also leave a starchy deposit on your ink pad therefore if you are going to stamp with regular stamping ink it is best to use an old ink pad that you won't be using for future heirloom stamping projects. 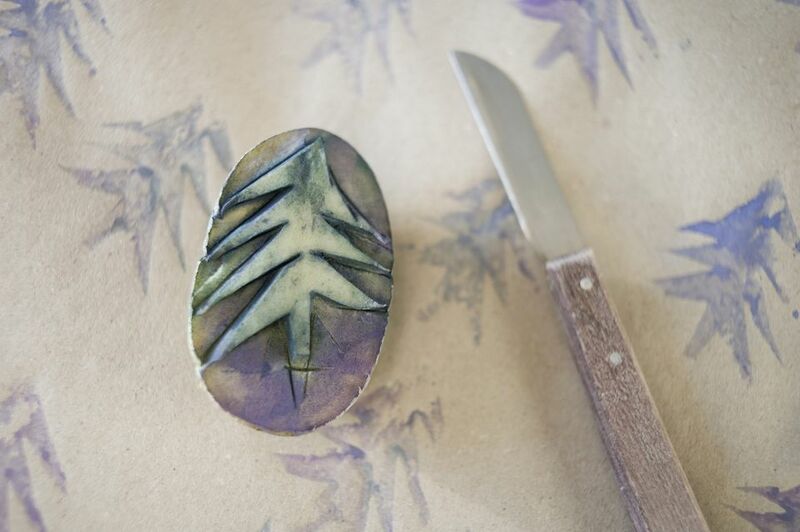 You can use paint to stamp a potato print with. Any thick paint will work well. Use a paintbrush to apply the paint to the surface of the potato to ensure there is even coverage. You could also pour some paint into a saucer and use this as an ink pad for your stamping project. Potato stamps are ideal for stamping on fabric. The shapes are typically bold with simple lines. Use fabric paint or ink to create patterned fabric using potato stamps. Add some sparkle to your project by mixing some glitter into your paint. Stamping with bubble wrap creates large blocks of pattern (depending, of course, on the size of bubble wrap you are stamping with). Pieces of bubble wrap are easy to find and are often used as packaging, making this an extremely low-cost stamping project. An example is the rainbow bubble wrap stamps shown by Fun Littles. Another really fun way to make an impression is to create fingerprint characters from your fingerprints. All you require to get started creating is an ink pad and a marker pen. Simply dab your finger into the ink pad and press your finger onto a piece of plain paper. When the ink is dry, take the marker pen and start doodling features onto the fingerprint to create your own funny characters. The cardboard tubes from paper towel rolls or toilet paper rolls make a great source of material for stamping. The cardboard rolls can be used to stamp a variety of shapes onto a page. While the basic shape of the cardboard roll is a circle, you can pinch and pull the cardboard tube to create different shapes. Teardrops and pear shapes are easy to create and can be used to create images such as flowers. You can use a rubber stamping ink pad or paint poured into a saucer or plate. Simply dab the cardboard tube into the paint or onto the ink pad until the surface is covered and then press it on paper to create an impression on the surface of the paper. It may take a few tries to get an even image as the cardboard is porous and it may absorb the ink or paint before you can stamp with it. The top of the cardboard tube may not be completely even. Therefore you may stamp shapes that have gaps in the shape. If this is incompatible with your design then simply discard the tube and try another. Squeeze one side of the tube to make a teardrop shape and try shaping the tube to create other types of image. A great background image can be created by stamping shapes onto a piece of paper, allowing each of the shapes to overlap slightly. Then color the portions of the image using different shades or colors to create a fun and striking effect. Try other types of tubes or shapes, such as polystyrene cups, and see what different effects can be achieved. A brayer roller is a tool used in rubber stamping projects to give an even coat of ink to a rubber stamp. It is also a great way to apply rubber stamping ink directly to paper. Impressions and decorative effects can be achieved by wrapping items such as rubber stamps or even pieces of fabric around the brayer. Radicchio lettuce can be used to create rose shapes. Martha Stewart put these to lovely effect to make rose stationery. This is fun to do and all sorts of different shapes can be achieved with leafy vegetables like this. Try celery and other vegetables to see what effects and patterns you can achieve. When stamping with vegetables, remember that they naturally produce water and therefore they can dilute the ink or paint you use. This needn't detract from the finished results and the variations it provides can give added interest. You can make lace prints from a crochet lace doily and a rolling pin as shown by Helana and Ali. The best results will be achieved with a doily with plenty of texture, which is why a crochet doily is ideal. Tidbits shows how to make at striped print using a rolling pin. While this project uses a rubber stamp making sheet, a similar effect could be achieved using craft foam. Really attractive shapes can be achieved by stamping with a feather. You can use a large chicken feather, peacock feather, or other feathers for different effects. An alternative to using a feather would be using a leaf. Use the back of a leaf, where it is more textured, for a print. Use a brayer to apply the ink to the leaf or feather. Scrunched foil gives a lovely organic shape when stamped as Munchkins and Moms demonstrates in this pretty project. You could draw some flowers or even create a small apple stamp using the eraser of a pencil to stamp some apples, depending on the season. Here's a brilliant idea from Filth Wizardry —making stamps from Plasticine. This gives an almost infinite number of shapes and styles you can create to stamp with. Yarn block stamps or yarn block printing is a project which can be enjoyed by adults and children alike. An Everyday Story shows how to make these great prints. Here's another low-cost idea for creating great-looking stamped images. Pure and Noble shows how to use simple cardboard stamps to decorate t-shirts. These would also make great backgrounds for handmade cards and scrapbook pages. Create your own stamps using soft block or even erasers. This is a great way to produce your own stamps. Carving your own stamps gives you a greater degree of control over your work. More intricate designs can be achieved using stamp carving techniques. Whatever method you choose, creating your own DIY stamps is a fun way to create your own unique designs.